No rain. Lot's of racing. Win. 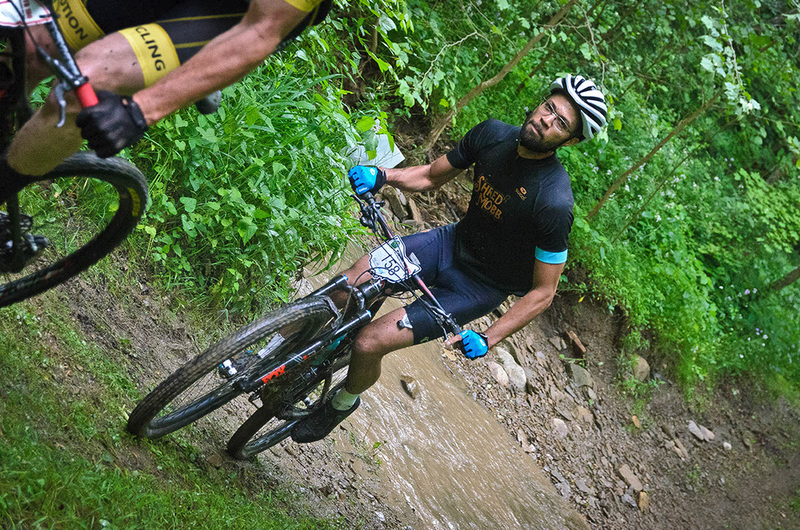 Check out the race report from our tallest Mobster, Brad S.
This has been a great year so far; first year racing mountain bike and I'm loving it. This makes trail race number 3. We woke up to a chilly morning but standing at the start line, could feel the sun starting to warm things up. Perfect weather for racing! The rain this past week had me a little worried, but the trail ended up being in great shape. The ground was still pretty firm, and wasn't at all dusty. Sure, there were a few puddles in the really low spots, but I was glad to not have to ride through peanut butter. At some point in the last few weeks a team went through and backfilled some of the roots/rocks, which made for a bit smoother ride, but it did take a little of the challenge out of it. Our field was the combined sport/expert group...I decided I was going to shoot for a mid pack finish. The course started off with about a mile and a quarter ride down Gorge Parkway, then rode almost all of Bedford backward. Touchstone was out of it because they were not able to close the road and we rode Karl's Corner the standard direction. I lined up at the front and ended up hanging in the middle of the lead group, once we all got moving. Surprisingly, everyone stuck together...I kind of expected it to thin out a bit more before hitting the single track, but no one seemed interested in attacking that early. When we did get to the trail, it was a bottleneck and I heard a few people behind me unclip because of the slowdown. Once on the trail, the field thinned out pretty quick. I was feeling good and was able to get by two riders when the trail popped back out on the multipurpose trail. I eventually ended up riding with Dave Marsi through a few sections, then started to fade. The second trail section of lap 2 gave me a chance to recover but halfway through the lap one rider caught me on a road section. We wished each other a good race and dropped back into the trail. Coming out of the trail at Egbert Road and Overlook Lane, one more rider caught up and was on my wheel the rest of the way through. Unfortunately by the end, I was pushing to hold him off, but couldn't pull off the final sprint...got me by a bike length, haha...next time! This was a fun race, and ended up finishing in the top third of the field. Congrats to the Shred Mobb on a great race, and to Michael Banks on finishing 4th! Also, many thanks to Ryan for the opportunity to be on a great team with experienced riders to learn from. Makes this so much more fun and can't wait for the next race! Shredd Mobb Captain Michael B. tripped down to Lake Hope to tear up some dirt. Check it. The first of two times I've been to Lake Hope was for the OMBC race in 2015. The second time was when I lined up at the start line for the annual OMBC Race to the Hills at Lake Hope, this past weekend. I believe ours was the biggest field of the day: a combination of the Men’s Sport Open, 30-39, and Clydesdale classes. In 2015 I rode off the front from the get go and had a substantial lead on the pack by mile 1.7 when I was forced to DNF due to an unexpected drop-off out of a sharp right turn. This year, determined not to repeat my 6.5 hours driving for 9 minutes of racing experience, I took a decidedly more measured approach. My plan was to go into the single track in the middle of the lead pack and then pick off riders one at a time. The start of Lake Hope is characterized by a half-mile long road/gravel climb and attacks usually fly right out of the gate. My plan in mind, I lined up in row two. I had to go way into the red, just to hold on to the back of the lead group and hit peak HR for the day before we ever saw singletrack. At least I was in the race though. We descended some freshly cut single track to the treacherous drop-off but this time I was prepared and nearly clipped the wheel of a less fortunate rider in front of me. First position made up and only many more to go, I thought to myself. Until this point, I had been holding back a little. In part, because I was weary of the drop-off but also because I had only ridden my new Rocky Mountain Element 970 once before and very briefly at that. The Rocky's geo speaks to me with 120mm front travel, 100mm rear, and an adjustable head tube angle that ranges from 69-70 degrees. For Lake Hope I had it set at 69.25 degrees or a quarter degree slacker than my previous Cannondale Scalpel SI Carbon 3 and .15 degrees steeper than the Yeti I rode before the Scalpel. I find that this is setup is pretty close to a Goldilocks setup between my two prior bikes and truly reflects my preferred riding style. That said, I'd likely go a setting steeper at a tamer trail and a setting slacker on a rowdier one. Speaking of trails, can I just say that Lake Hope is way up there with Mohican State Park as far as quality Ohio single track goes?! It features tons of rocks, roots, and all around chunky gnarr that are often neglected on more modern flow trails, but also manages to reward riders with epic, high speed, white knuckle descents that challenge even seasoned riders to grow and progress. Some of the numerous climbs feature tricky rock features and washed out runoff channels, which I will make a point of riding until I clear them when I head back down for recreational riding soon. Like Mohican, Lake Hope is fairly long (the race loop is 17 miles, give or take) and the river crossings make up for the lack of an FU Climb. Actually, who am I kidding? Nobody misses that climb. In short: If you haven't been, make the time and go. Hell, there is an onsite State Campground, make it a weekend! Back to the race though. We were about 3 or 4 miles in and the field had started to spread out. I was able to pass another rider who went down but we were catching up to some of the slower riders in the Expert Women's field. As sometimes happens when the back of an earlier field is caught, we began a game of cat and mouse with a couple of the guys in my field. Tom Svec from Flat Tire Co. led the chase group and made his move to pass the first lady we caught. Next went the middle wheel, who now had to chase down Tom, and finally me a minute or so after him. I caught the third to last Expert Women and our middle guy, whom I passed and dropped, but never saw Tom again until the finish. At one point I lost position to one of the riders from the 40-49 field who had started in our wave but were scored separately, when I nearly ran into a hornet's nest that had been flagged for a ride-around and only realized that I was about to do so when he called it out to me. Thanks, dude; that could’ve hurt!! I spent much of the rest of the race by myself picking off one more expert single speeder and one other guy from our field, mildly annoyed with myself that I hadn't gone harder in the early break. At this point, I caught up to Jen Toops from Paradise Garage, the reigning Women's OMBC Champion and a contender for this year's NUE Series. Happy for a fast wheel to ride I decided to ride behind her for some time and to regain my composure. When the trail widened she called for me to move around and I did. We rode together for a bit longer until I saw the 40-49 rider who had passed me earlier and gave chase. I clawed away at his lead, precious seconds at a time, until I was nearly back on his wheel, just a half of a river crossing behind him. True to rowdy riding form, I cut the turn coming out of the crossing tight and through the brush and promptly sunk my wheel into a concealed hole. Whoomp-Whooomp. Somehow I managed to stay upright and re-positioned on the trail to give chase once more when the trail took a sharp turn to the left. So this was it. "That nasty, steep, rocky, rooty, rutted out climb at the end" Tom Weaver from KSD had warned me about. It was all of that and then some. I rode about 3 quarters of the way up but eventually, my rear wheel slid out and I had to push the rest of the way. I looked over my shoulder and saw some riders in the distance lining up for the climb. Determined not to give up a position this near the end, I doubled down, took a running start to jump onto my bike and get riding again. I'm still not sure how, but I managed to do so and got going. I dragged myself up the last bit of road back to the finish line, for fourth place. Lake Hope is a truly epic trail system and if you have never ridden there I highly recommend it. This magical place somehow manages to combine flow with old school gnarr. In light of this, the BC Shred Mobb intends to host an open 4-day training camp there in the Spring of 2018. The camp will consist of a 3-nights stay at a local cabin and 4 days riding. We will ride mountain and road bikes. We may also decide to do some gravel rides if there is interest. The exact cost is TBD but will go toward the cost of the cabin. Any surplus will be donated to the Athens Bicycle Club which maintains the Lake Hope State Park MTB trail system. You are responsible for your own food but we will do our best to find a cabin that has a kitchen and/or grill. We are a race team and this is a training camp, participants will be expected to be of intermediate to advanced skill level - if you finish midpack or better at most OMBC Sport races you enter, you should be good. Please get in touch with the shop in person or by phone if you would like to be added to the email list for forthcoming details. The Shred Mobb was well represented at the this years Funk Bottoms Gravel Grinder. Here's a race report from Shred Mobbster Carl J. aka YouTube.